The solution for stress? DESTRESS! Loosen up, unwind, do the things that will make you happy. Teaching has been giving me some reasons to quit and it's not just because of the bulk of work. I have learned to handle deadlines and all the paper works. But when your principles and character that become tested, then there's another kind of tougher stress that lies ahead. Whew! This requires some great deal of decision making. 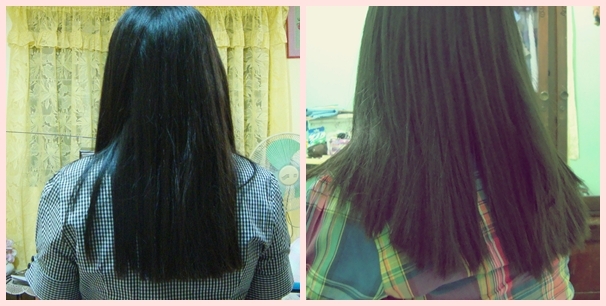 Before and After... how come before looks better? The destressing activity wasn't over. Or did I just get more stressed with my hair? I met my friend Anne this morning in our favorite mall. I treated my tummy to a much craved seafood pasta and mango crepe..heaven! Good food brings good mood! After our bulgy belly meal, we finally watched the US film version of The Girl with the Dragon Tattoo. I already watched the Swedish version of the film and sorry to say, I preferred it more. Can you resist me? LOL Can't wait to wear this! Wishing everyone a great, happy and relaxing weekend! I don't think any woman is ever happy with her haircut...ever. It's just our nature. It is hard to tell the difference in your hair length. It looks just a tad shorter to me but it could be the photo. I agree that one should do whatever it takes to de-stress! For me, it's reading. Shopping is a good cure too! I rarely go to the hair salon precisely because I come out looking worse! I don't know, but most don't know how to style my hair. Is yours layered now? It looks like it in the after picture. As for your question: I am probably in the bottom third ;-) oh well. Hi Duni! Yes it was layered...badly layered. My first attempt to actually place a little style on my hair turned out as a nightmare. Thank you for liking my shirt btw :) happy wekend! Your hair looks good in both pics but maybe the light on the first made it look shinier. Sometimes when life is very stressful it is hard to shake it off and let go. I am so sorry you are having such a tough time right now. I hope calmer more relaxed days are ahead whatever you decide. Keep us posted. Hey girl, don't stress. Your hair looks lovely. Keep your chin up and I hope you have a brighter day tomorrow!